and to fulfill the longings of your heart. and the ultimate questions of human existence. Anytime. Anywhere. All in just 20 minutes a day. "Reb Wayne and Ellen provide you with a spiritual recipe, derived from the deepest sources of our mystical tradition, that is doable and affordable in time and energy. If you do it, it will work." "Reb Wayne and Ellen are profoundly inspired lovers of God in all of Its forms. 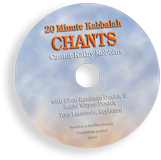 20 Minute Kabbalah is a gem that offers readers and listeners clear and comprehensive guidance into the magical world of the higher realms. There is essential truth on every page; every phrase glows with passion. What a delight! I whole-heartedly recommend this book to all spiritual seekers who are truly ready to open their hearts to be blessed by a God-filled reality." "With this simple, joyous, yet substantive book, we can create and sustain a personal spiritual practice that transforms each day into a vehicle for awakening. 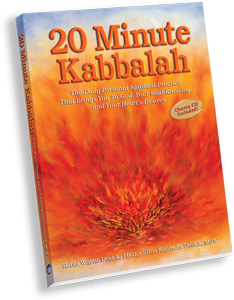 20 Minute Kabbalah combines the profound weight of Tradition with the exquisite Lightness of Spirit to give us a practical and inspiring tool for coming into God's Presence each day." you may not need the full explanation or instructions given in the book. to take you through the practice. 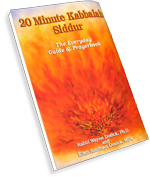 can serve as your everyday guidebook to praying the Spiral Tree of Life. upon lying down or rising up." for home, office, pocket, purse, or briefcase. one for every member of the family. Whenever you want to talk to God. Copyright © 2007 Rabbi Wayne Dosick and Ellen Kaufman Dosick. Web Design by GeoVisual Solutions.